Head and body length: 25-26.5cm. They can have 1 – 3 litters a year and around 1 – 7 young per litter. The gestation periods last around 45 days, weaned after 8 – 10 weeks. Capable of breeding at around 7 months but on average this takes place at around 10 – 12 months. In the wild less than 1% lives for more than 6 years but have they have been known to live to 8 or 9 years. Squirrels are commonly found in deciduous and mixed woodlands, they are also found in hedgerows, banking, gardens, trees and farms. Dreys (nests) are compact and sphere-shaped. 30-60cm in diameter and surrounded by twigs, dry leaves and grass inside. 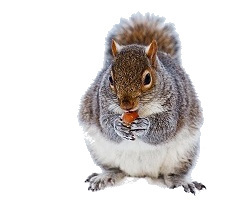 Squirrels feed on acorns, tree shoots, flowers, nuts, fruits, roots and cereals. Food is eaten at ground level. Their range covers 2-10 hectares and they bury spare food 2-5cm below the soil or in tree hollows. They are diurnal, active before sunrise and after sunset. The peak of activity is in the autumn. Squirrels can nest in lofts, wall cavities, and the void in-between false walls. By gnawing they can damage tree bark and the fabric of buildings. Grey squirrels are widespread and not protected in the UK.